Developed in 1939 as an alternative to the Bf 109 that served in the Luftwaffe. 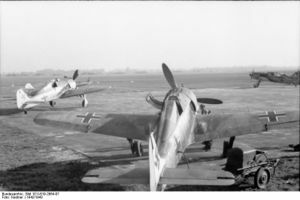 The Fw 190 entered mass production in 1941. Great gun arrangement, 20mm cannons are equally effective on ground targets as they are against planes. Atrocious maneuverability, among the worst of all tier Vs that are multiroles or standard fighters. 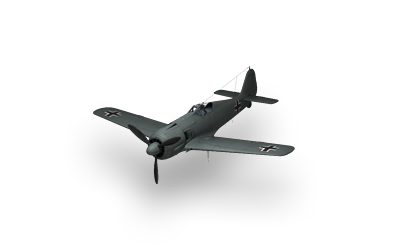 This is the first re-searchable multirole fighter available to the German line. 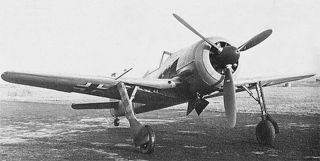 Unlike the Yak-7 and F4F multirole fighters, the 190 A-1 is very fast and has high altitude performance. That being said, staying at a high altitude is imperative. The XP-44 can compete at higher altitudes, but you will rip it apart with your guns. It's HP pool rivals that of its American competitors as well, being a three-way tie for the most HP for a multirole at tier 5. Unlike its American rivals, the A-1 has a great gun assortment. The 20mm guns are very effective at destroying aircraft as well as ground targets. This makes up for it's lackluster bombs. The 50lb bombs do not do much damage. Stay at high altitude for best performance. Use your guns to shred through enemies and avoid turn fights. It is imperative to avoid falling into turn and burn battles, as the A-1, and indeed the A-5 that follows it, cannot function in turning battles to save their lives, so more of a boom and zoom approach is recommended; just be sure you have enough boost left to get out of trouble. This page was last modified on 7 July 2018, at 17:23.